The latest market selloff can be blamed on any number of things. China slowdown or a possible hard landing in China, basic profit taking after a six-year run, declining earnings, no further QE in the US, a uptick in rates in the US, weak US economy, commodity (including crude oil) collapse, weakening of 'risk' currencies due to the commodity selloff, disappearance of buybacks, dividends being lowered, strong US dollar pressuring balance sheets, bear markets in pc sales, rail fees,.........the list goes on and on. Bottom line: we need something solid to rally on and I fear any earnings pops will be given back. Netflix will be a good example tomorrow after the close. We simply cannot justify going higher without a catalyst. Is our economic recovery truly as strong as charts would imply? Are we strong enough to stand on our own at these levels, or have we overshot the boundaries thanks to quantitative easing? Are economics in the U.S. strong enough or does recession lie ahead? 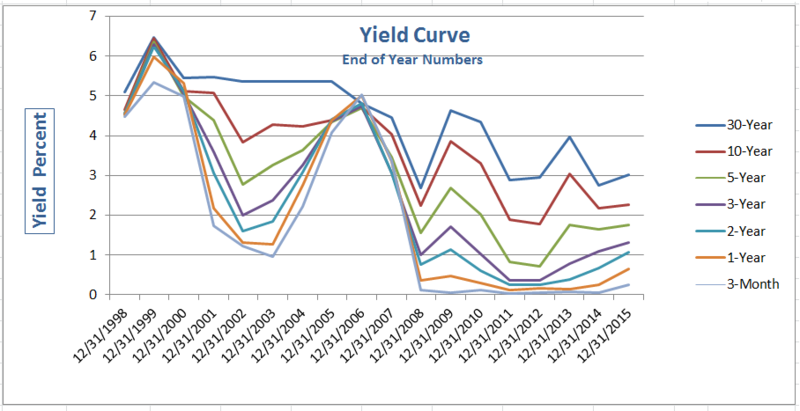 Curve watchers Anonymous has an eye on the yield curve. Here is a snapshot of year-end-closing values from 1998-12-31 through 2015-12-31. Unlike 1999-2000 and again 2007-2007, no portions of the yield curve are inverted today (shorter-term rates higher than longer-term rates). You know it's coming and it won't be any easier to take than when you were small and your Mother said "I told you so". The blogisphere will now erupt with the force of an annoying snaggle tooth emphatically screaming "I warned you" and "I said it was coming.........now buy my plan so you're prepared" and ca-ching, you cough up the coin like a kid at the carnival freak show. Every smidiot and hack will now attack your inbox on how they could have prevented your losses and how (via in their premier plan) you would have benefited this week.......if you had only listened. Market Pause. Would You Buy Here? With all of America's 401k's flowing into equities and with CNBC continually saying bonds are the worst trade around, one has to determine if continuing to buy here is the smartest way to go or take partials, roll up your stops and raise cash rather than buying this top. Technically the monthly chart shows MACD posed to bear cross although the month is far from over. The bollinger band is flattening out which does not say to "buy" here but remain cautious and sit on hands. Here TLT for a quick glance at the monthly and yeah, it's still selling. Could see a temporary bounce (here or there) but overall, the trend is still down so equities (or cash) it is. 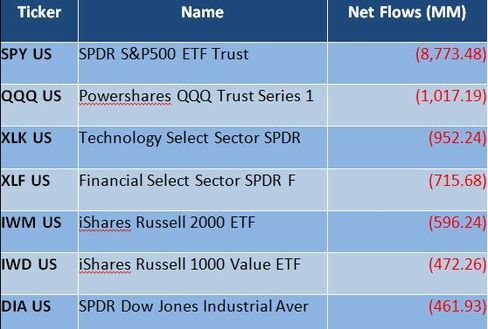 The majority of sector ETFs closed their week below their 50d with energy having filled the gap.....and found sellers waiting there. SPX itself found sellers at $2100 (clearly we weren't the only ones selling) which is 17x earnings. More and more are accepting reality that earnings have dropped the most in six years and the Fed (with no QE) will most likely begin to slowly raise interest rates in September. Don't believe me, just ask Barclays. According to BTIG Research, there remains cause to be concerned after the stock market's bounce last week. For the first time since the October low, breakdowns have outnumbered breakouts. This is a byproduct of the 5% pullback in the SPX over the past two weeks, which naturally saw some stocks break support levels. We are inclined to worry about breakdowns when they are abundant (at least 10% of the SPX, more than this time around) and recurrent (outnumbering breakouts for at least 2-3 weeks). Volatility definitely increased leading up to this weeks quadruple witching and the S&P (400, 500 and 600) index re-balancing taking place tonight after the close. Selling the last two weeks resulted in oversold conditions in the near term charts and massive short covering at the market as every fund and investment bank bought new shares (as they rebalanced ahead of the indexes), resulted in two astounding days of back to back two percent gains. Bulls were partying in the streets but is it warranted? Has anything truly changed?